Unsure about how #hashfootery works? Hopefully your questions will be answered here. Anyone on Twitter can join, just by tweeting their score prediction for the currently featured match using the appropriate hashtag. This is a good way to invite your friends to join in. You can also join by logging into hashfootery.com with your Twitter username and password. You can then pick a sweepstake team and submit your predictions. When you join, @hashfootery will follow you on Twitter. To keep up to date with featured matches, competition announcements and general banter, you should follow @hashfootery back. You want access to my Twitter account. Can I trust you not to spam my followers? I promise there will be no status updates or DMs on your Twitter account generated by this website. Automated tweets will mostly originate from the @hashfooteryBot Twitter account. For example, when you successfully submit a score prediction in a tweet, @hashfooteryBot will generate an automatic reply to you on Twitter. As of Sat 21 Aug 2010, the default permission now granted to hashfootery.com when you click the Allow button on Twitter is set to read-only access. You can review and modify the level of access you have granted to this and other Twitter applications on your Twitter � Settings � Connections page. The sweepstake only applied to our first season in 2010/2011. Your sweepstake team will only come into play at the end of the season, when bonus points will be awarded based on your team's position in the final league table and the Fair Play league table. You can select your sweepstake team when you are logged in to hashfootery.com from the Sweepstake page. Just click on an available number in the grid. Your sweepstake team selection will be revealed as soon as all twenty numbers have been chosen. What is the point of hashfootery? It's just for a bit of fun. Pure and simple. Some football-related online games draw massive numbers of subscribers, where there is little opportunity to have a bit of banter with other players. Already #hashfootery has the feel of a small friendly community. Rest assured, there is no corporate or marketing machine behind #hashfootery - the motive is pure and playful. What do points make? PRIZES, by any chance? No. 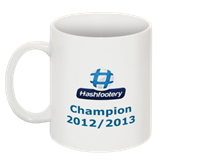 There are no tangible prizes on #hashfootery - just the satisfaction of getting more points than your rivals. Let's face it, if there were prizes, we'd have to have all sorts of terms and conditions. And age limits. And certain people and their family members wouldn't be allowed to take part. And people can easily take the hump. And get suspicious and get into silly big stroppy disputes. Yes. We now have modest trophies, provided by our hosting/coding/trophy sponsor: @movingWiFi, in the shape of limited edition mugs for the overall league and cup winners. Do we have to predict scores for all the Premier League games? No. Just two or three are selected (from the 10 scheduled matches) each weekend. Featured matches are announced on Twitter via @hashfootery and @kirstieh and can be viewed on this website. The season's started - can I still join in now? YES, please do. The more the merrier. Predicting correct scores is actually quite difficult, so, who knows, you may get a good run of predictions and catch up. Also every month the coveted title of Hashfooterer of the month is up for grabs, based on points scored in that month only. Oh and invite your friends to join in as well. Is there a special format to use when predicting scores in a tweet? Detecting scores on Twitter is done by performing a Twitter search for the hashtag allocated to the next featured match. If any resulting tweet contains two separate single-digit numbers, these are assumed to be scores and assigned to home and away teams respectively. The order of the scores is the important thing. All the other text is ignored. You can only tweet a score prediction for one match at a time. The #hashfootery Twitter listener starts up at 10am every morning and searches Twitter every few minutes until the kickoff of the first featured match that day. If all goes well, you will receive an automated Twitter reply from @hashfootery acknowledging your score prediction. If you're having difficulty, you can also edit your prediction on the Predictions page on this website. Currently Twitter users who protect their tweets must use the website to manage predictions as their tweets will not be picked up in a Twitter search. My tweets are protected. Can I play #hashfootery? Yes, but any tweeted predictions will have to mention @hashfootery or @hashfooterybot and you should request that those accounts are following you (so that they can see your protected tweets, obviously). Also, your protected status will be respected and your tweets will NOT appear on the sidebar of the hashfootery.com webpages. How do you decide which matches are featured on #hashfootery? The selection of matches and the derivation of appropriate hashtags is carried out solely by @kirstieh. Nobody said this was going to be a democracy. There may be innuendo involved. Wealdstone? Bury*? WTF? But I need form guides, player profiles. It's not just guessing, this hashfootery y'know! On weekends when the Premier League players are resting on international duty and such, guest fixtures from the non-league, eh, leagues may be featured on #hashfootery. For example, Wealdstone and Bury Town* currently play in the Ryman Premier Division. See www.footballwebpages.co.uk to bone up on the form in this league. *Bury Town are not to be confused with Bury FC, who play in League 2. Is there an online database with historical results that might be useful?